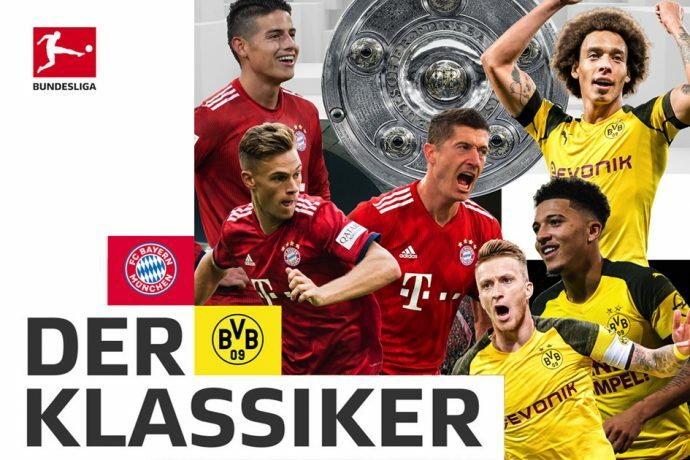 The role of hunter and hunted has switched between Bundesliga title contenders FC Bayern Munich and Borussia Dortmund for weeks now — the question is who will be trying to track down whom after Germany’s heavyweight duo slug it out in “Der Klassiker” on Saturday? Not since their battle royale at Signal Iduna Park on 11 April 2012 has Der Klassiker held such significance so late in a Bundesliga campaign. That night, Jürgen Klopp’s Dortmund started with a three-point cushion they would plump up to six with a 1-0 win en route to winning a second successive Bundesliga title. Same teams, switch the stage, and the stakes are even higher this time: Bayern have won the league crown in each of the six seasons since Klopp’s men last claimed it, and Dortmund have just a two-point advantage in hand on their rivals ahead of German football’s showdown contest. Dortmund would have hoped to have been sitting more prettily at the top of the table given they were nine points clear of Bayern in mid-December having dropped just two points up to that point and having beaten the reigning champions in Klassiker Part 1. However, a surprise pre-Christmas loss to Fortuna Düsseldorf sparked a Dortmund mini-slump while Bayern roared back with a stunning six-win streak to overhaul Lucien Favre’s men. Still, there was another twist on Matchday 27 with Bayern’s 1-1 draw at Sport-Club Freiburg and Dortmund’s 2-0 defeat of VfL Wolfsburg handing the advantage back to BVB in a push-and-pull battle at a distance that often mirrors the keenly contested duel that explodes when they meet on the pitch. “When we hosted the game in the first half of the season we went behind but turned it around. Being at home gives you that extra push,” ex-Bayern man Mario Götze told bundesliga.com of Dortmund’s thrill-a-minute 3-2 win over Bayern on Matchday 11. So do the capacity crowd that will pack into the Allianz Arena to watch Robert Lewandowski try to down his former club again, see Jadon Sancho work his magic on the flank for the visitors, and witness some of European football’s premier talents produce a spectacle that captures the attention of millions around the world. “There’s a real rivalry between the two teams. Dortmund are the second team in Germany, and have been strong now for some years. It’s the biggest game of the season,” said Bayern’s Serge Gnabry, who admitted he had previously been as sucked into the drama as any other fan, watching intently on TV during his time in England and at Hoffenheim before joining Bayern. This time, the German international will have the unique view only 22 other men (plus the officials) will enjoy, while others tune in around the planet to see the premier exhibition of Football As It’s Meant To Be. Some 50 official Viewing Parties across the world are being organised by both clubs and the Bundesliga. From the Bundesliga Experience event in Mexico City, with Bundesliga title winner and legend Pavel Pardo, to Houston in the US, in the Nigerian capital Abuja and the metropoles of New Delhi in India and Jakarta, Indonesia – fans will be waking up early on one continent while burning the candle late into the night on another, just to get a glimpse of their heroes in action. Offline fan events as well as mini-tournaments, dinners and the guest appearance of some of the men who have played central roles in Klassikers down the years will bring more than a taste of Der Klassiker experience. Add to that the wall-to-wall coverage on the Bundesliga’s and both clubs’ official channels, and even fans cosily installed in their homes will feel like they are taking their seat inside Bayern’s stately home where – perhaps – a telling blow will be delivered in the 2018/19 title race.